You are here: Home | Concrete Raising Systems | What can I do if my front steps are sinking? This is a question we’ve seen posted on the internet. The answers we found for fixing sinking front steps were surprising. We’ve been in the foam jacking business for a number of years now. Our knowledge of how to build homes goes back even further And what we saw online could only have come from someone who had a limited knowledge of available options for this problem. That is the challenge of trying to do research online. You have a question and you search for answers on Google or Bing. When you find what you are searching for you believe that you have found the answer. Because the information you find online must be accurate right? Would it come as a surprise to you to know that the searches are filled with inaccurate information or unknowledgeable opinions? • using a jack for a car, dig down a bit and jack up the front to make it level. Place a large pressure treated beam underneath it for support and then remove the jack. Wow. Pretty shocking to us. These solutions are nowhere in the ballpark of what could and should be done with sinking concrete steps. As a consumer, how do you know what to do when your search results come up these answers? 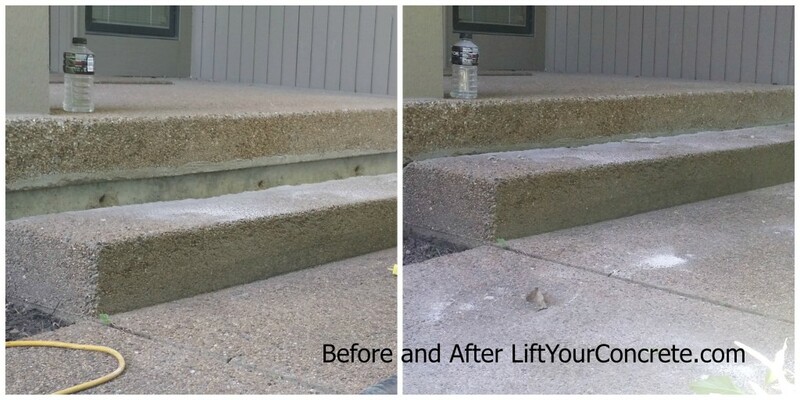 As experts in the field of lifting concrete steps, you can find your answer here. If you need more information on how to evaluate what you find on the internet, keep reading. People using the internet for information and tips don’t check the date the information was posted. If the information is a few years old, chances are the information is old as well. Technology and solutions can change with time. Make sure you have the most up to date information that is available for your search. Also, follow up with any links you find. Knowledgeable articles should also have a link to the company or individual that wrote it. Follow the links. Are they qualified to answer the question? Do they have experience in the area? Read the reviews that are on the site. Do they appear to be an expert in the field or someone throwing 2 cents into the mix? When posing a query online, use your common sense. If something seems a bit far-fetched to you, move on and locate information that seems more palatable. In this case, prying a step up and shoving bricks underneath it to lift it into place is not a solution that warrants much consideration. If the information seems amiss, refer to Tip #1. You’ll find the information is probably old or the source unreliable and inexperienced at best. Trust yourself and keep looking! In this situation, once you gather your information, find reliable sources to check your facts. A good concrete raising expert will want to look at your sinking concrete steps in person or will ask you to send photos. A concrete raising expert will be able to educate you about their solution and provide a detailed estimate for the work. Ask for referrals and visit their website. Make sure you do business with a company who can back up their work. It’s always best to go with a person you trust and a company that has been in business for a while. These are indicators that the job will be done right the first time. Internet searches have moved from being a search engine to an answer engine. But take care to run down the answers you do find online with local experts. The internet may be able to point you in the right direction, but a good expert will be able to get you there with confidence! This article was originally posted in June 2015 and recently updated. 4 Responses to What can I do if my front steps are sinking? Wait, you can’t believe everything on the internet?? I am always the hero when I recommend your company. Clients save money and get their concrete lifted into place! Sinking steps are something that you find a lot in the UK. I blame the damp and cold weather! Actually, sinking steps can be weather related. It is the ground losing moisture and sinking under the weight of the concrete. A dry climate adds to the possibility of concrete sinking. Steps, driveways, garage floors, basement floors and pool decking.